The book 'Nagar Nandini' is another famous creation of this author, it was first publish on September 1961. The author used the pen name 'Shankar' for writing but his real name is Manishankar Mukhapadhyay. 'Chowrangi', 'Simabaddha' and 'Jano Aranya' are the great works of this author. And films are also made base on these three books. There is a list of his notable works- 'Charan Chhuye Jai', 'Koto Ajanare', 'Ei To Sedin', 'Jog Biyog Gun Bhag', 'Manab Sagar Tire', 'Jekhane Jemon', 'Janmabhumi', 'Tonoya', 'Tirandaj', 'Muktir Swad', 'Nabina', 'Sukhsagar', 'Mansanman', 'Sonar Sansar', 'Tin Bhuboner Katha', 'Bododoy' etc. 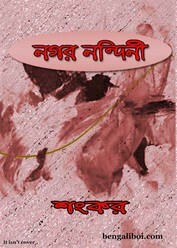 Now I want to share a book 'Nagar Nandini' as pdf file.